There are no active programs at this time. 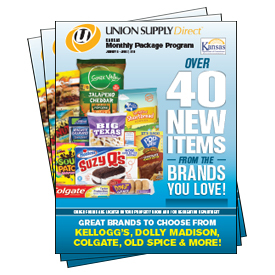 Should you need assistance, please email us at customerservice@unionsupplydirect.com or by calling (866)402-0644. Family and friends can order a monthly package for their loved ones incarcerated in the Kansas Department of Corrections. Monthly packages consist primarily of food, drinks, hygiene items and much more. The items presented on the shopping pages are pre-approved by the Kansas Department of Corrections so you can shop with the assurance that everything we make available is approved. Please see the Rules & Regulations section for more information on Monthly Packages. To begin shopping, enter the inmate’s KS Department of Corrections ID#.